This stylish solution will definitely emphasize your or your project’s individuality and make a solid impression on the website visitors. Dark colors, creative textures and simple yet catchy fonts are perfectly combined in this neat design. 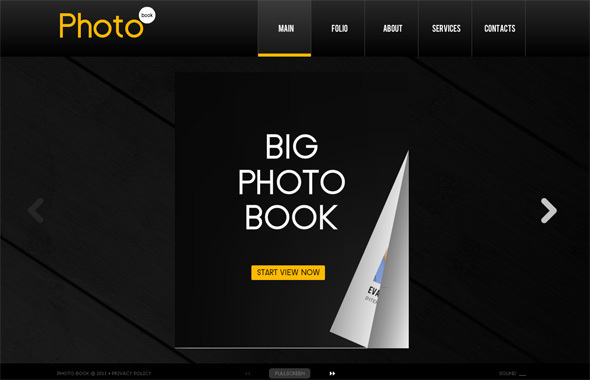 Each section of the website is performed as a separate flip book that is navigated with interactive arrow buttons. Also, you can turn over the book’s pages by clicking on the page’s corner or dragging it with a mouse. The interactive drop down menu allows you to easily navigate the website and browse through the sections. As soon as the template is yours, you can easily create as many sections and sub-sections as you need. The powerful control panel allows you to customize the template without getting into any coding. Due to the mostly intuitive interface, the website editing turns into a true pleasure. You can easily add your own logo, change the titles and other text content, embed images and media, add visual effects, and much more. 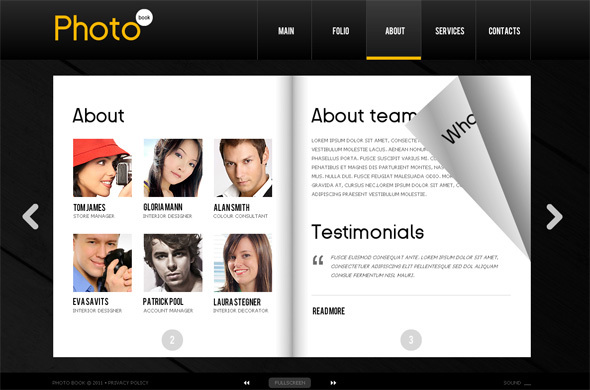 The powerful Moto CMS integrated into the template opens the widest opportunities to the user. It couldn’t be any easier to create pages, add buttons, change the background as well as make more complicated (but in fact, easy) modifications like embedding a new slot or font, etc. The Flash CMS template with page flip effect is a complete website that can be easily customized and edited. 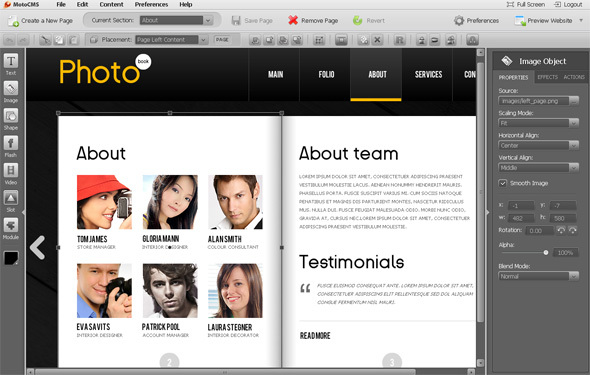 To evaluate the opportunities of the control panel, you can try the template’s Demo.